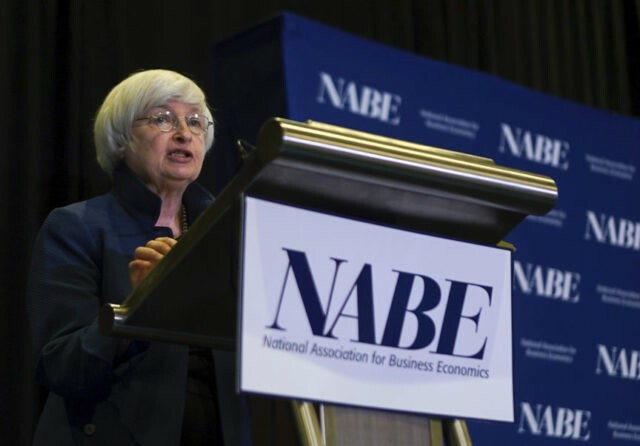 CLEVELAND (AP) — Federal Reserve Chair Janet Yellen acknowledged Tuesday that the Fed is puzzled by the persistence of unusually low inflation and that it might have to adjust the timing of its interest rate policies accordingly. Speaking to a conference of economists, Yellen touched upon key questions the Fed is confronting as it tries to determine why inflation has remained chronically below its target of 2 percent annually. The Fed chair said officials still expect the forces keeping inflation low to fade eventually. But she conceded that the Fed may need to adjust its assumptions. Inflation, which was nearing the 2 percent goal at the start of the year, has since then fallen further behind and is now rising at an annual rate of just 1.4 percent. Yellen has previously attributed the miss on inflation this year to temporary factors, including a price war among mobile phone companies. She and other Fed officials have predicted inflation would soon begin rising toward the Fed’s target, helped by tight labor markets that will drive up wage gains. In her remarks Tuesday, Yellen said this outcome of a rebound in inflation is still likely. But she said the central bank needed to remain alert to the possibility that other forces not clearly understood might continue to keep inflation lower than the Fed’s 2 percent goal. The Fed chair cautioned that if the central bank moved too slowly in raising rates, it could inadvertently allow the economy to become overheated and thus have to raise rates so quickly in the future that it could push the country into a recession. “It would be imprudent to keep monetary policy on hold until inflation is back to 2 percent,” Yellen said. During a question-and-answer session, Yellen said the Fed would be “looking at inflation very carefully” to determine the timing of upcoming rate hikes. But she said the data is likely to be difficult to assess, in part because of the effects of the recent devastating hurricanes, which have forced up gasoline prices. Yellen’s remarks came a week after Fed officials left their benchmark rate unchanged but announced that they would start gradually shrinking their huge portfolio of Treasury and mortgage bonds. Those holdings had grown from purchases the Fed made over the past nine years to try to lower long-term borrowing rates and help the U.S. economy recover from the worst downturn since the 1930s. The Fed did retain a forecast showing that officials expect to boost rates three times this year. So far, they have increased their benchmark lending rate twice, in March and June, leaving it at a still-low range of 1 percent to 1.25 percent. Last week, the Fed said the reductions in its bond holdings would begin in October by initially allowing a modest $10 billion in maturing bonds to roll off the $4.5 trillion balance sheet each month. Asked about how long-term loan rates might respond to reductions in the Fed’s bond portfolio, Yellen cited a study that estimated that the increase in its bond holdings had lowered such rates by about 1 percentage point. But she said the reduction in the holdings wouldn’t likely raise rates by as much as a percentage point given that the Fed intended to keep the size of its balance sheet significantly higher than it was before the financial crisis. She said any upward pressure on rates would likely be gradual and take place over several years. Later Thursday, Yellen toured a job training center operated by Cuyahoga Community College and participated in a roundtable with students, faculty and potential employers. Yellen, who has visited a number of job centers during her time as Fed chair, told the group that job training was especially important now as employers find it harder in a tight labor market to find workers with the necessary skills.